felt good to once again be motivated to bring out the Nikon and enjoy the evening’s dinner. 1. Heat 2 TB of EVOO on medium-high in a 4-quart stovetop casserole. Season the Lamb Shanks liberally with Salt & Pepper, add to the casserole & sear to a deep color, about 15 minutes Remove to a platter. Add the prepared Turnips, brown lightly until beginning to tenderize. Remove to a bowl. 2. Reduce the heat to low. Add the chopped Leeks & sliced Garlic, sauté until softened. Stir in the Lemon peel, Rosemary & the Wine. 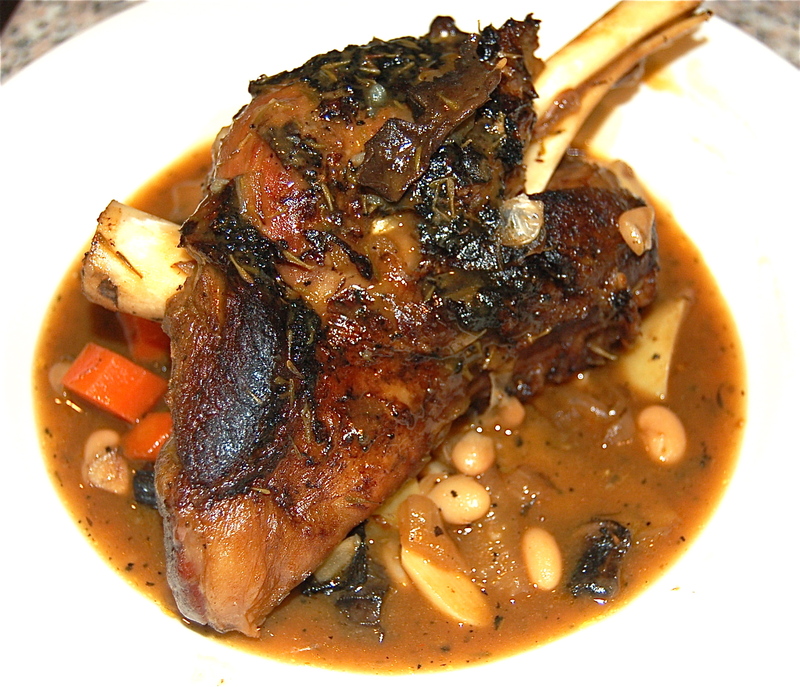 Return the Lamb Shanks to the casserole, cover & simmer on low heat for 1 hour. 3. While meat cooks, add the canned Beans & their broth to a saucepan, bring to a simmer, cover & cook for 10 minutes on low. Turn off the heat & set aside. 4. After 1 hour, the Lamb should begin to tenderize. Remove them to a platter, leaving all liquid in the casserole. Drain the Beans & add to the casserole. along with the Turnips, the 1- 1/2 cups of stock & the (optional) Demi Glace. Season with Salt & Pepper. Bring to a simmer. Tuck in the Lamb, cover & cook on low 30 to 45 minutes, until all the ingredients in the casserole are very tender. 5. Transfer to plates, garnished with Rosemary branches & an additional spoonful of the sauce & serve. Marjorie L. Pendergast Marjorie Pendergast & Company BHHS Fox & Roach Realtors 1149 W. Lancaster Avenue Rosemont, PA 19010 Cell: 610-999-1973 email: marji.pendergast@foxroach.com Please note the NEW email address! !